“We’ve been dismantled in some ways. We’ve lost some level of confidence and some level of trust,” Gov. Justice said at a news conference at the state capitol. He also said he wanted to appoint those already vying for a seat in the special election — which will coincide with the November general election — and acknowledged they could have an advantage as incumbents. Aside from Armstead and Jenkins, 18 others have filed to run for the two unexpired terms. With the court still needing to continue its work, Armstead and Jenkins were among the names listed by the Judicial Vancancy Advisory Commission as potentital appointees to hold the court over until the special elections. "We don't need to be in a state of flux here for any longer than we have to be. I wanted someone who would geniunely want to run again," Justice said. "I can't determine the outcome of elections -- we all know that. But we can absolutely determine the outcome if we appoint someone and they're not going to run." Armstead will hold the seat former Justice Menis Ketchum left at the end of July. He announced his retirement one day before the House Judiciary Committee began an investigation into the possible impeachment of justices on the state Supreme Court. That term expires in 2020. Jenkins will hold the seat recently vacated by former Justice Robin Davis, who announced her retirement one day after being named in four of 11 articles of impeachment adopted by the House of Delegates. That term expires in 2024. Ketchum and Davis were both elected to the court as Democrats. The state changed the law in 2015 to make the election of Supreme Court justices nonpartisan. Ketchum pleaded guilty this week to a federal fraud charge for using a state vehicle on personal golf outings. Davis was impeached for a lack of administrative oversight of the court, the overpayment of senior status judges and lavish spending on court office renovations. The remaining three justices -- Chief Justice Margaret Workman, Justice Beth Walker and suspended Justice Allen Loughry -- were also impeached by the House of Delegates for their roles in the court scandal. They await trial in the state Senate. In addition, Loughry has pleaded not guilty to 25 counts of federal charges, including fraud, witness tampering, making false statements and obstruction. Both vacancies on the court occurred before a Aug. 14 deadline -- which have triggered a special election in November to coincide with the general election. Should any other justices leave the court, the Governor would appointment a replacement until May 2020. Armstead and Jenkins are both well-known Republicans who have served in the West Virginia statehouse. Armstead resigned from the House of Delegates last week after having served in the chamber for two decades. He was first elected in 1998 and has held the position as speaker since 2015 -- after the Republican party took control of the statehouse in the 2014 election. Armstead had publicly expressed interest in a seat on the bench as early as January -- and attempted to recuse himself from the impeachment proceedings in the House. Gov. Justice will name a replacement for Armstead’s seat in the House’s 40th District, and the House of Delegates is set to elect a new speaker this week. Jenkins is stepping away from a seat in the U.S. House of Representatives representing the state’s 3rd Congressional District, a role he has held since 2014. He served in the West Virginia House and Senate from 1994 to 2013 as a Democrat before returning to the GOP to run for the U.S. House seat. Jenkins lost a bid for the Republican nomination for U.S. Senate earlier this year. His congressional seat will remain vacant until the November election. The appointments drew polar opposite responses for the leaders of the state’s two main political parties, which have especially been at odds throughout the impeachment process of the state’s high court. Republican party chairwoman Melody Potter applauded Justice’s picks for the state’s high court. “Today’s appointments are an important first step in the process to restore faith in our state’s judicial branch of government. Both of these appointees understand that courts exist to interpret our Constitution and laws without attempting to set policy or legislate from the bench,” Potter said. But Democrats have cried afoul over what they described as the targeting of members of their party on the bench throughout the impeachment proceedings. "Talk about having no faith in our justice system or our leadership in West Virginia, this type of political gamesmanship is exactly why these decisions should be left up to the people of West Virginia. 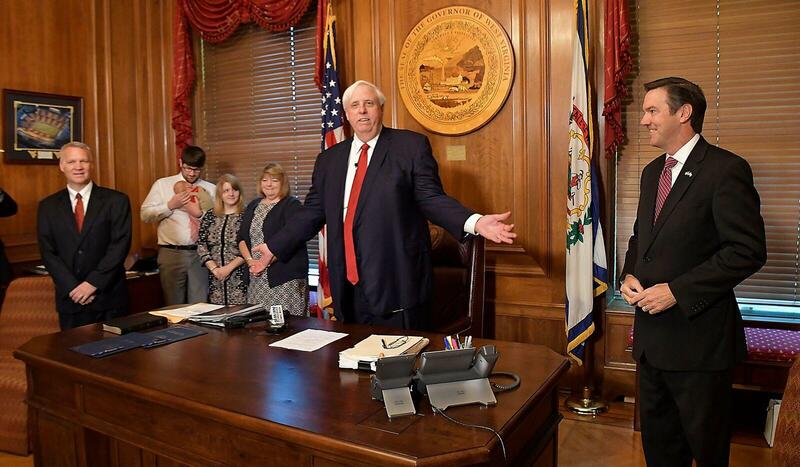 Unfortunately, Republican Leadership is more concerned with political games than listening hardworking West Virginians who have their livelihoods at stake,” West Virginia Democratic Party chairwoman Belinda Biafore said in a written statement. The West Virginia Supreme Court of Appeals was initially scheduled to continue its work on Sept. 5 but has delayed its return until October. However, due to the need for an expedited ruling, the court will take up Massey Energy CEO Don Blankenship's challenge to the state's so-called "sore loser" election law and hear arguments Wednesday, Aug. 29. Chief Justice Margaret Workman, Justice Beth Walker and three temporarily-appointed circuit judges will preside over the case. Impeachment proceedings against Davis, Loughry, Walker and Workman are scheduled to continue Sept. 11 in the state Senate.